WNYC’s The Greene Space teams up with Wyclef Jean‘s Yele Haiti Foundation and Timberland, and The Promised Land Radio Special hosted by Majora Carter to present interviews with visionaries who have innovative ideas about changing lives and transforming communities. The Promised Land 90-minute interview will explore Wyclef Jean’s humanitarian work and how his music and his creativity have enhanced his work in Haiti. Because Majora herself is an activist, the conversations she has with like-minded people are especially intimate. 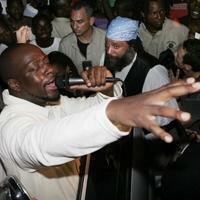 Wyclef will perform a few musical selections.